Less than a week to go! That is all and then Christmas Day will be here!… and with it hopefully comes tons of gifts, festive foods and an abundance of love. There is a lot of gift guides out there and they can really help us with our selection or if nothing else inspire ideas and options you may not have thought about before. This year Mark and I have decided that we will drop personal gifts on account of getting something bigger for the house that all of us can enjoy. Our choice wasn’t easy as we want a lot – TV for the kids room, so we don’t have to spend hours starring at kiddie movies, new oven for the kitchen as the existing one is falling to pieces, so cooking can be a pleasure again, new coffee machine which will allow us to enjoy a perfect cup of coffee every morning, tablet, as everyone seems to have one except us… and the list can go on and on… But as we are not millionaires and funds are limited at present, we had to narrow it down to a few things, things which we will make the most use of or something we really need opposed to wanting. We cut our loooong list down to 3 main items; we need to get for ourselves. Currently we have a work PC and an old XP based laptop. We have no tablet (I wish we had, don’t know why but I am sure I need one) and sometimes we struggle. Too often, too many household members want or need to do something on the net. With me occupying the main PC almost 24/7 (work, you know :-)) there is only 1 laptop to go around. In light of this we really need a new one. Samsung ATIV Book 9 Lite looks perfect. It ticks all the boxes of what we were looking for. As you all know Mark cooks and bakes a lot. We have a mixer but it is 10 years old now and it simply cannot handle what Mark wants it to do, “Not fit for purpose” he mumbles a lot. You might think that this choice will be more a gift for Mark, but … not really. If he doesn’t bake lovely bread, delicious cookies, make us donuts, cakes, cheesecakes or any of the other yummy stuff we will have nothing nice to eat… so you see, it is in the best interest for all of us to get Mark a new mixer, he’s happy and therefore we are happy. We did a lot of research and the KitchenAid seems to be the one to get, Mark is forever pointing them out on the TV on cook shows. We are going for a red one, so it can match our other kitchen accessories like the kettle, toaster and microwave oven. Yes, you might think this is just an extravagance to want a PS4 when we have PS3 and for example need a new oven but… we are cave people… so we really need it. A lot of our entertainment is home based. We have all consoles out there (except for new PS4 and Xbox One), gaming PC and 100s of DVD – this is the way we spend our free time. We don’t do “going out” so often. We invest in our home entertainment and a PS4 seems to be next logical step. 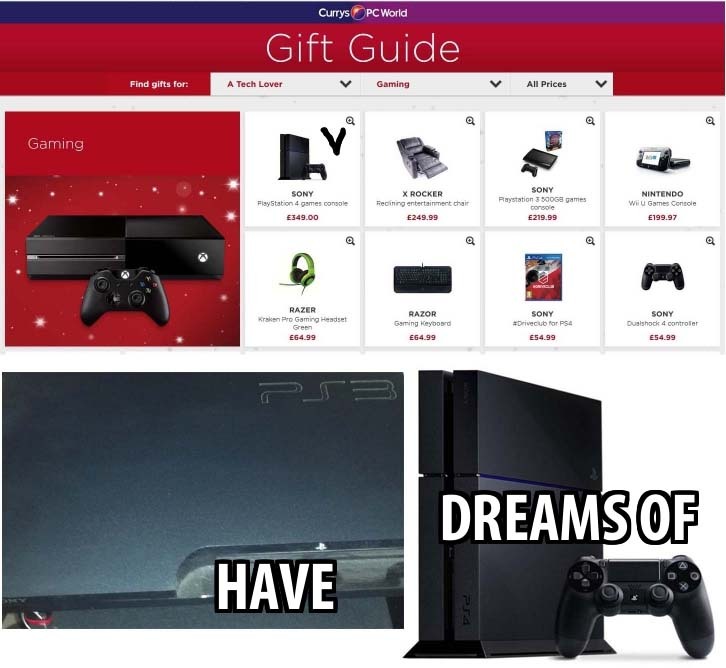 So here you go… this is what we want to find under Christmas tree this year. 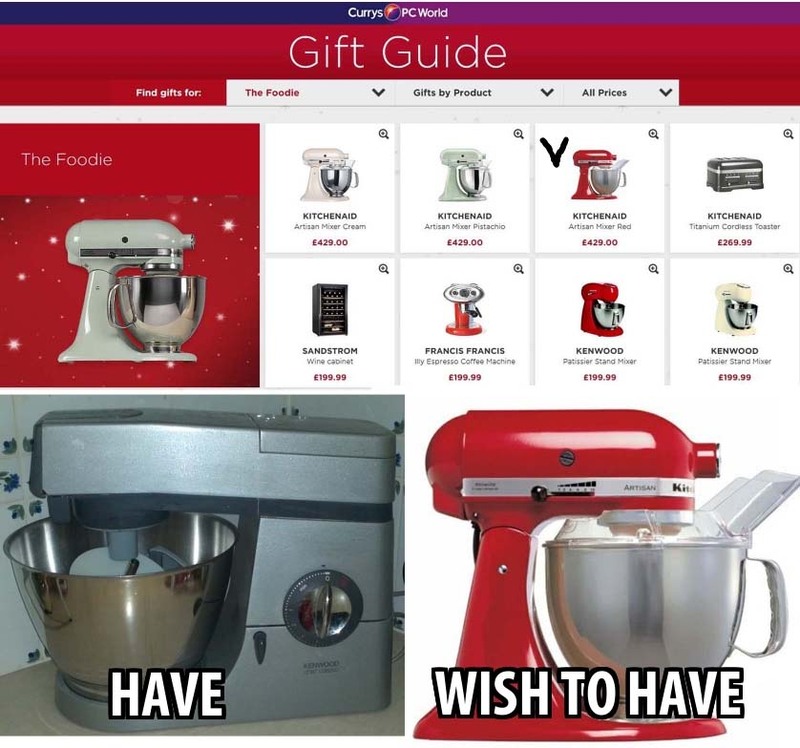 What is on top of your Christmas Wish List? 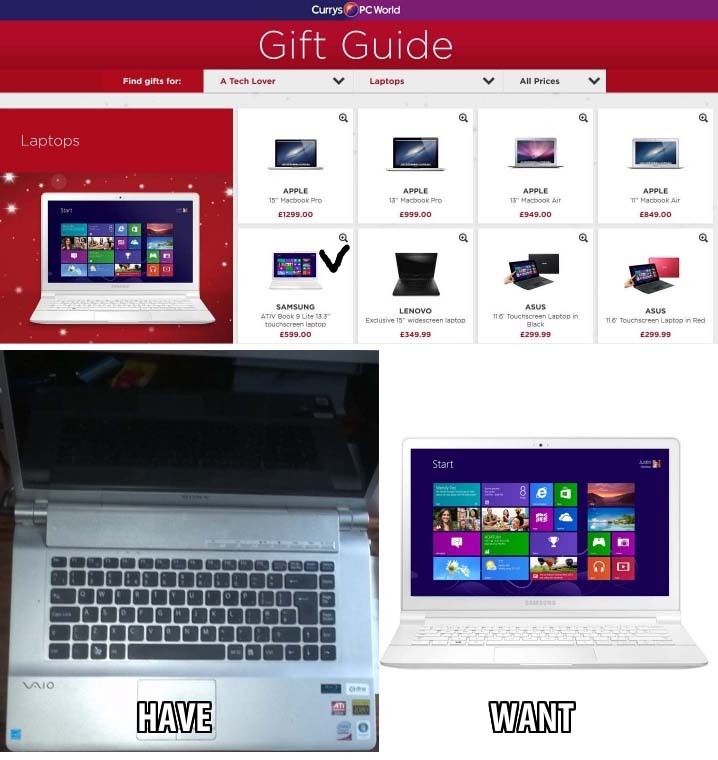 This post is my entry into Currys PC World Blogger Gift Guide Challenge #bloggergiftguide. If you wish to take part please hurry as it ends on Friday 20 December 2013 at 11:59pm. Great picks. I would love a new laptop as well, even a Mac, but it wont happen this year and a DSLR camera. Hope your wishes come true!